Hey y'all!!! 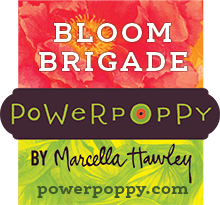 Are you ready for some new Power Poppy stamps?!?!?!?!?!? Well, your wait is almost over. Marcella has designed 4 new releases that are like no other, as is typical Marcy, and they are unique, and oh, so special as only Marcy can do. So, get prepared to have your socks blown off, because September 15, all 4 will be available for purchase!!!! That's only 3 more days people!!! 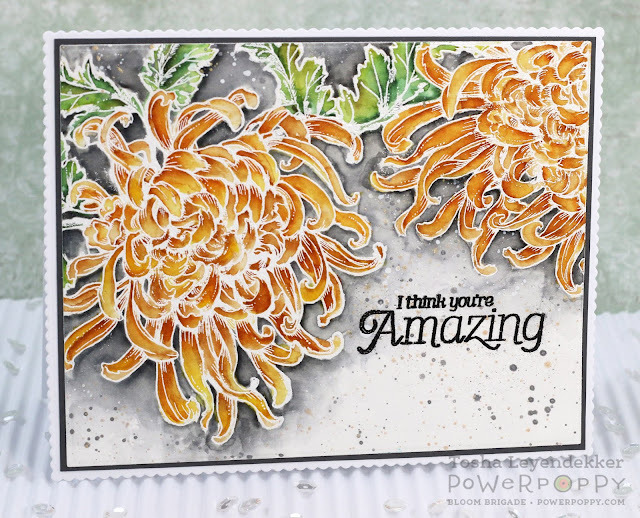 Today, we are featuring the absolutely STUNNING stamp set called Chrysanthemum XL. It consists of a large mum that measures almost 4"x4", along with a couple of leaves, stems and beautifully fonted sentiments. I stepped out of my Copic comfort zone, and worked with my Zig coloring pens. I have not had success with these pens until I learned that the right watercolor paper is EVERYTHING!!! Then, they are easy-peasy!!! Truly!!! I was so nervous to try, but the nerves left pretty quickly after seeing the results. I'm really happy with how this turned out, and though it took awhile to color the background and image (this card is 5"x6 1/2"), it was simple. I will list the paper and markers that I used at the bottom of this post. I also added some acrylic paint splatters that I watered down a little bit. Tomorrow we will have a really unique and fun stamp set to share!! I can't wait to show you the two projects that I came up with. This set has already come in handy for a couple of the men in my life. Tosh the white embossing look awesome... Beautiful design and great coloring. The size of this Fuji Mum is deliciously perfect. Thanks for allowing me to see your creation. You definitely got you zigs figured out! Nice job! Just gorgeous with the embossing. I haven't tried white like that but will give it a try for sure now. Thanks for the inspiration. Beautiful that’s all I can say. I love the dark background it really makes the flower Pop. Stunning card!like the use of two flowers! I LOVE the embossing and your coloring is FAB!!!! Very pretty card, and what a fun image to color. Wow, such a gorgeous card! This flower is so amazing. Love how your card turned out! Gotta get this stamp for sure. Awesome card! Love the white embossed Mum! This is just yummy. Love the size of the bloom and your coloring is just outstanding. Nicely done. Wow what a fantastic cards! I love that you white embossed the card! The colors are just gorgeous! Beautiful Card. The grey around the flowers really make them stand out. What a wonderful card - love the image and the design. It's beautiful!! You did a fabulous job coloring with Zig markers!! Love the look of the white embossing powder.